If you are looking for a career in the health sciences, you should consider radiologic technology. Not only are there many benefits to the job, but there is also a significant demand for radiologic technologists. According to the Bureau of Labor Statistics Occupational Handbook, overall employment of radiologic technologists is projected to grow 13 percent from 2016 to 2026, faster than the average for all occupations. There are many reasons for the spike in available jobs for radiologic technologists, such as the elderly population’s continual growth. As the elderly population grows, so will their health concerns, like fractures and breaks that are caused by osteoporosis, which typically can only be diagnosed by enhanced imagining. 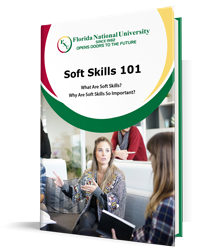 accredited Associates Degree at Florida National University. With two locations in Miami and Hialeah, the radiologic technology program will teach you not only the training that you need to thrive as a radiologic technologist but also the confidence to enter the health sciences industry. Known as radiographers, radiologic technologists conduct diagnostic imaging examinations like x-rays on patients. They also operate magnetic resonance imaging (MRI) scanners to create a diagnostic image. Radiologic technologists’ generally work in healthcare facilities while more than half work in hospital settings. Radiologic technologists have many duties, such as adjusting and maintain imaging equipment preparing patients for specific procedures, which includes taking a patient’s medical history and also answer any questions about the procedure. Radiologic technologies have a lot of responsibilities, but they also have a high salary. According to the Occupational Outlook Handbook, the median annual wage for radiologic technologists in May 2017 was $58,440, with the lowest 10 percent earned less than $39,840, and the highest 10 percent earned more than $84,110. Radiologic technologists must keep precise and detailed patient records, and follow orders precisely as given by physicians regarding what area of the patient’s body that they need to image. They must also know how to operate computerized equipment to take images properly. Once the imagines have been made, they work with physicians to evaluate them and to then determine whether advanced photos need to be conducted. Is There a Demand for Radiologic Technologists in South Florida? Radiologic technologists who graduate from accredited degree programs and who obtain certifications will have the best job prospects when they are ready to enter the workforce. Across the United States, and especially South Florida where baby-boomers are aging, there will be a significant increase in medical conditions like Alzheimer’s disease and cancer. These medical conditions will require imaging to help appropriately make medical diagnoses, and radiologic technologists will be needed to take these images. 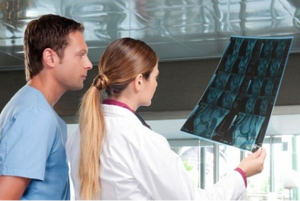 What Kind of Degree Do I Need to Become a Radiologic Technologist? Radiologic technologists must have an associate’s degree, and they must be licensed or certified in most states across the country. But if your state does not require radiologic technologists to be licensed or certified, most employers generally prefer or expect prospective applicants to have the extra licenses and certifications. If you are interested in becoming a radiologic technologist, you are going to need to enroll in a Radiologic Technology Program, and you can do so at FNU. The Associate of Science in Radiologic Technology degree program at FNU requires 86 credits for completion, as well as 600 clinical hours. Twenty-three credits are general education courses, while the remaining 63 credit hours are core course requirements that include Medical Terminology, Radiographic Pathology, Medical Terminology, and Clinical Journal of Radiology. These courses are designed to provide students with the knowledge and critical skills that are used by professional and licensed radiological technologists to ensure that every patient is given the proper care. The Associate of Science in Radiologic Technology (RT) degree program consists of training each student to the field of diagnostic imagining, which is done through a combination of classroom courses and assignments, laboratory work, and clinical hours, which will grow a student’s experience with patients to introduce them to working in the real world. The radiologic technology degree program also teaches students the safe and proper way to use the sophisticated medical equipment. The technology used by radiologic technologist include x-ray machine and MRI scanners, and they must be handled delicately and used with extreme patience and care. 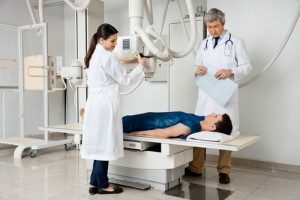 The equipment used by radiologic technologists is some of the most technologically advanced medical equipment and misusing the equipment during x-ray imagining not only disregards safety protocols but can potentially harm the patients. The radiologic technology degree program at FNU is designed to prepare students for the National Certifying Examination by the American Registry of Radiologic Technologists and also the State of Florida Department of Health and Rehabilitative Service General License Examination. Upon the successful completion of the Certifying Examination, the associate’s program prepares students for a career as a member of a healthcare team in hospitals, clinics, or physician’s offices. Finding the right accredited radiologic technology program in Miami does not have to time-consuming and exhausting. Founded in 1982, FNU is approved by the Southern Association of Colleges and Schools Commission on Colleges to award an Associates of Science degree in Radiologic Technology to those students who graduate from the degree program. For more information about the associate’s program, such as a course catalog and financial help, contact us here. Do not miss out on bettering your future. Enroll in online. Reach out to our school today!